The chances of people using Wireless microphone nowadays are frequent, but not many people really use their microphones well. The so-called "good" is nothing more than a good pickup, long life and harmless to health. Select the microphone, should be based on the use of the occasion and the sound quality requirements, combined with the characteristics of a variety of microphones, considering the selection. For example, high-quality recording and broadcasting, the main requirements of good sound quality, condenser microphone should be used, aluminum microphone or advanced moving coil microphone; for general amplification, the use of ordinary moving coil type can be; when the speaker moves from time to time Or talk with the megaphone distance greater, such as karaoke OK, should use unidirectional, low sensitivity microphone to reduce noise interference. 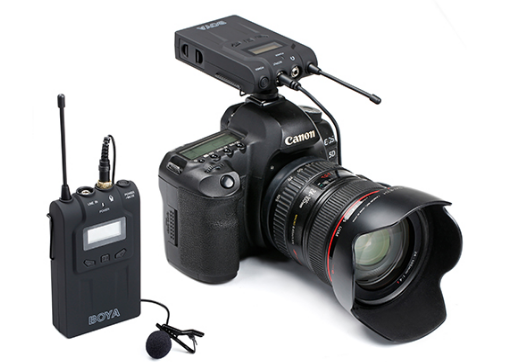 The BOYA BY-WM6 is a UHF Wireless Microphone System designed to work with DSLR camera, Camcorder, PC and more.